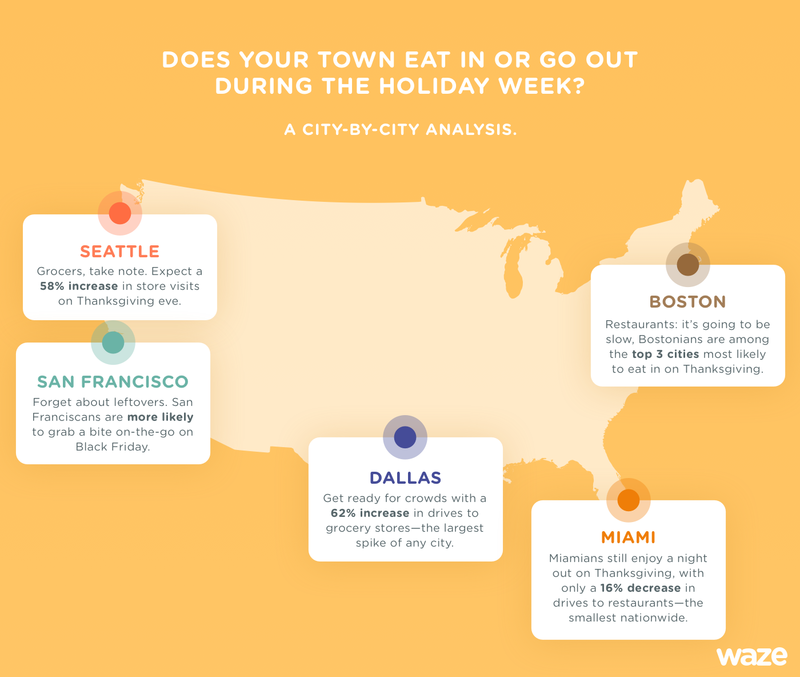 The Compass Blog, Driven by Waze: Holiday Insights Series: Does Your City Like to Eat In or Go Out? Holiday Insights Series: Does Your City Like to Eat In or Go Out? It's no surprise that in the days leading up to Thanksgiving, we see a huge spike in visits to grocery stores and a significant decrease in navigations to restaurants as people prepare for the big feast. This is a nationwide trend, but as we dig deeper into the data, we see that changes in dining and shopping behavior vary from city to city. In some cities, people are more likely to go out for their Thanksgiving meal, and in others, residents are more likely to stock up on groceries—and the patterns continue to shift going into Black Friday and the weekend. Wondering if your city prefers to eat in or dine out? 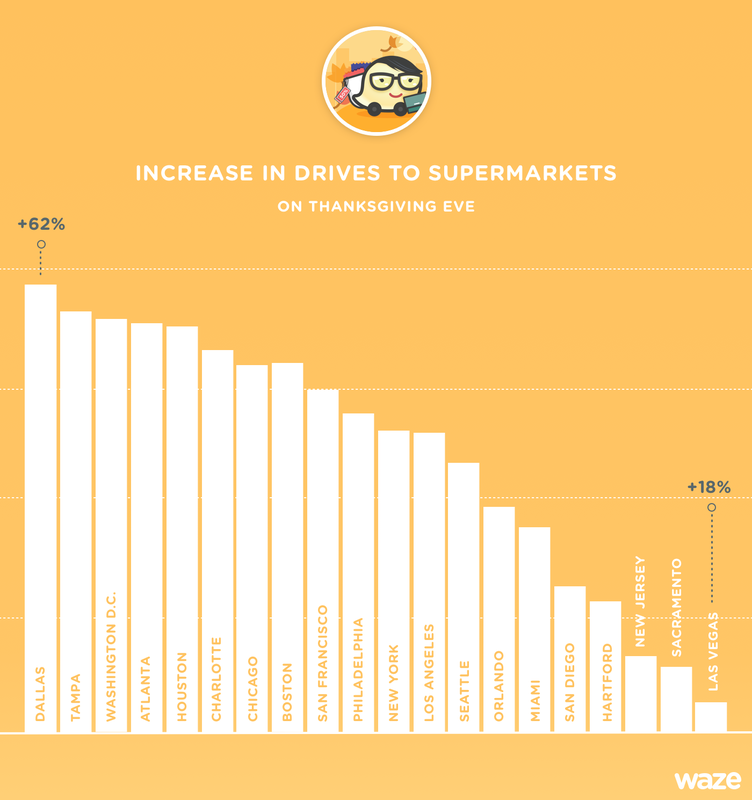 We analyzed driving behavior in the top 20 US cities on Waze, and we measured the increase in navigations to supermarkets and grocery stores on Thanksgiving Eve, compared to each city's normal volume throughout November and December. Overall, Seattle is the city with the highest proportion of drives to supermarkets on Thanksgiving Eve. Dallas saw a 62 percent increase in navigations to locations in this category—the biggest increase nationwide—while Las Vegas saw the smallest increase overall of only 16 percent. 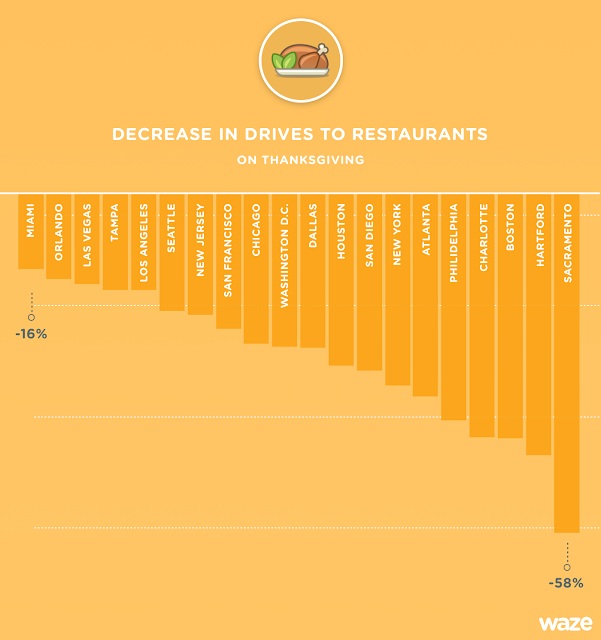 We saw a consistent decrease in navigations to restaurants on Thanksgiving Day, but in some cities the drop was not very substantial, suggesting that a traditional Thanksgiving at home is less common in certain places. Miami, for instance, was the city where we observed the smallest decrease in drives to restaurants—at just 16 percent, the decrease was 2.5 times smaller than the national average. Other cities that saw a smaller decrease in drives to restaurants include Orlando, Las Vegas, and Los Angeles. On the other end of the spectrum, cities such as Sacramento, Hartford, and Boston were the ones where the most people embraced a stay-at-home Thanksgiving. Sacramento saw a decrease in drives to restaurants of 58 percent on Thanksgiving Day. After a packed day with family and friends and lots of leftovers on the dinner table, we assumed most people would enjoy leftovers at home on the day after Thanksgiving. 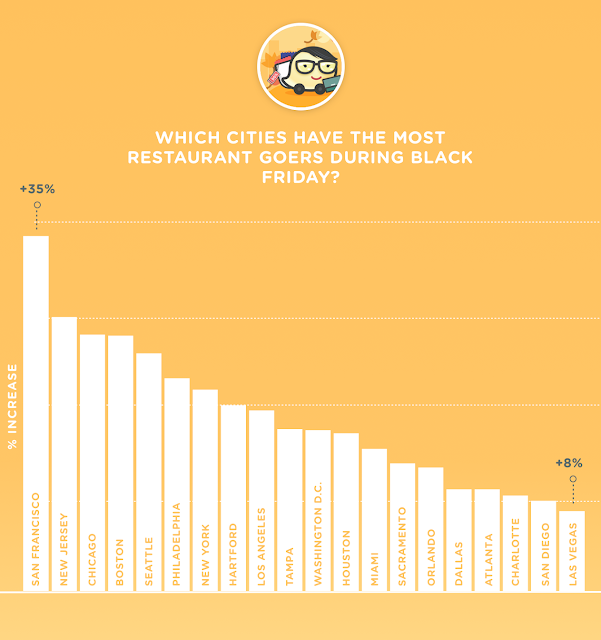 Nonetheless, Black Friday shopping madness meant plenty of Wazers were out and about, resulting in an increase in drives to restaurants nationwide on Black Friday. It's interesting to see how driving behavior can reflect the cultural tendencies that vary from region to region and city to city. Cities such as Las Vegas and Miami change their typical driving patterns and behaviors very little at this time of year compared to Dallas or Sacramento, where driving patterns are majorly disrupted around Thanksgiving. Brands with distinct regional strategies can learn from these differences between cities to better understand their regional audiences. This was what happened in 2015. We'll make sure we keep an eye on driving trends this year and share with you the latest insights about your consumers while they're on the go. *Data analyzed for the top 20 cities in the US. The variation in navigations to the categories is measured against the average number of navigations each city has during November and December 2015 to the respective categories.